Despite soft macroeconomic conditions, the market for mobile communications equipment will grow by a robust 13 percent this year, propelled by climbing shipments of mobile handsets and tablets, particularly devices supporting the 4G long term evolution (LTE) wireless standard. 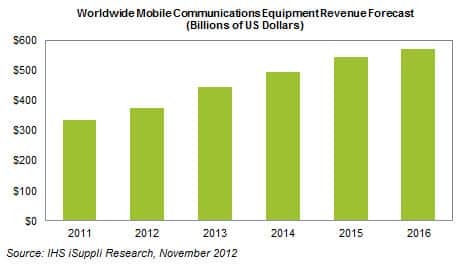 Total factory revenue from original equipment manufacturers making mobile communications equipment is projected to reach $376 billion by year-end, up from $334 billion in 2011, according to an IHS iSuppli Wireless Systems Market Tracker report from information and analytics provider IHS (NYSE: IHS). Next year, overall revenue for mobile communications equipment is forecast to rise to $444 million, as shown in the figure below. Driven by mobile broadband, the five-year compound annual growth rate until 2016 will amount to 11 percent. IHS defines mobile communications equipment factory revenue as what manufacturers earn from the sale of devices into the channel—in this case, mobile communications equipment like smartphones and other handsets. The category also includes wireless infrastructure gear such as routers. In particular, the increasing proportion of handsets being sold as smartphones affects semiconductor content positively. When compared with previous handset designs, for instance, smartphones carry increased costs for application processors, memory bits and sensors, favorably impacting the semiconductor suppliers providing those components. Moreover, smartphone support for the next-generation LTE wireless standard also drives semiconductor content, because more capable digital basebands, RF transceivers and power amplifiers are required. As a result, the semiconductor market for mobile communications is set to generate $74 billion at the close of 2012, up 5 percent from $71 billion in 2011. While wireless semiconductor revenue has been revised down slightly from earlier estimates due to the underperforming global economy, the wireless segment as a whole remains one of the few areas in the worldwide electronics value chain expected to keep growing. Among carriers, spending on wireless infrastructure gear is increasingly being focused on LTE. Expenditures on 4G LTE will exceed $8 billion this year, more than double the $4 billion spent in 2011. And starting next year, LTE will dominate the global wireless infrastructure market over 3.5/3.75G-related investments. Moving forward, the most successful manufacturers of mobile communications equipment will be those that allow wireless carriers to cost-effectively upgrade their base stations to 4G LTE—an important competitive edge in a tightening market. Ecosystem relationships and expanded visibility will also continue to be keys to success. High-profile mergers and acquisitions—exemplified by the likes of Qualcomm and Atheros, Broadcom and Beceem, and MediaTek and Ralink—have become important, and the Nokia-Microsoft partnership on smartphones is also notable.